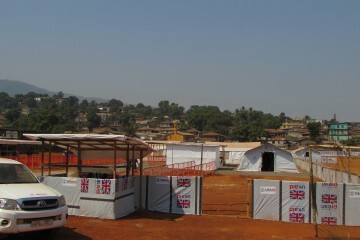 East Freetown is one of the worst Ebola affected areas in Sierra Leone right now. One month ago Lifeline Nehemiah Projects, our partner organisation in Sierra Leone, gathered a group of community leaders in Eastern Freetown to discuss the lack of health care available for Ebola victims in the local area. The community leaders asked us to take the lead in developing a local Ebola treatment centre. We responded quickly by securing a plot of land with the local authorities, digging a soak-away pit and building a basic clinic structure. This caught the attention of a number of international health organisations and NGOs, including the World Health Organisation, Medair and Oxfam, who offered to partner with us in order to build and manage the clinic. Building began in late November and the Kuntorloh clinic opening ceremony was held on 5th January to start receiving and treating patients. The first patient to be cured of the disease by our amazing team of staff walked out of the clinic Ebola free on 11th February 2015. Sorie, 24, will be the first of many.